In the general population of humans, you regularly find two extreme views when those humans are contemplating two similar items that are priced significantly different. One perspective reasons that the two items are so similar that there is no way the more expensive item could be that much better. The other perspective assumes that because an item is more expensive, it must be better. When it comes to choosing fluorocarbon or nylon fishing line, you can bet both of those assumptions are regularly made. And both of those assumptions are very wrong. Fluorocarbon began gaining popularity as a material for fishing line in the early 2000’s. It was billed as invisible and came with a cost nearly three times that of its nylon counterpart. That pricing disparity is still present today. For example, a 30-meter spool of Orvis nylon tippet costs $4.95. 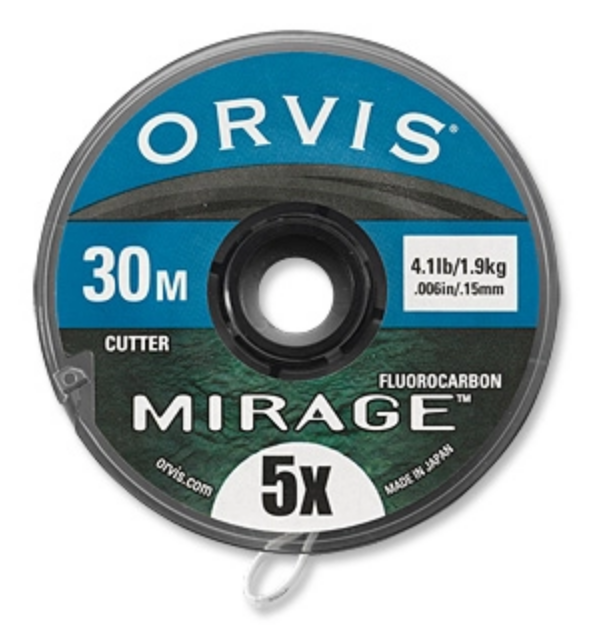 A 30-meter spool of Orvis fluorocarbon tippet costs $14.95. That’s a pretty big difference! But is fluorocarbon that much better? First, it’s important to understand that the higher price of fluorocarbon is more a result of its manufacturing process than it is its fishing value. With that said, it does have some significant advantages over nylon, but it has a few disadvantages too. Where you’re fishing, what you’re fishing with and what you’re trying to accomplish should ultimately determine which material will best suit your needs. Below is a categorical contrast between fluorocarbon and nylon to help you decide. When you compare nylon and fluorocarbon of the same diameter, it will vary a little from brand to brand, but fluorocarbon nearly always has a higher breaking strength. And fluorocarbon is a harder material so it is significantly more abrasion resistant. The light refractive index of fluorocarbon is very similar to that of fresh water. For this reason, it is far less visible in the water than nylon. Do you want to see for yourself? Take a piece of 5X nylon tippet and a piece of 5X fluorocarbon tippet and dip them in a glass of water. Fluorocarbon is denser than water, which means it sinks. That’s a good thing if you’re trying to drift a nymph near the bottom. It’s not a good thing if you’re trying to drift a dry fly on the surface. Nylon suspends on the water, making it a far better choice when fishing dry flies. Nylon is far suppler than fluorocarbon, giving it a big edge when it comes to knots. Because fluorocarbon is stiffer, the knot often doesn’t seat properly. Since the knot is always the weakest link in your set-up, this can sometimes offset the superior breaking strength of fluorocarbon. When tying knots with fluorocarbon, take your time and use extra care to ensure that your knots seat well. I personally use both of these materials, depending mostly on where I’m fishing. In the Smokies, I fish a lot of dry flies. And even when I’m nymph fishing, it’s usually in fast, broken water where line visibility is just not an issue. For those reasons, I almost exclusively use nylon. Fluorocarbon just doesn’t seem to provide any real advantage. However, on many tailwaters like the Clinch, most of the runs are very clear, unbroken and slow moving. Therefore, line visibility can be a major factor. Additionally, I am fishing with nymphs probably 90% of the time on rivers like the Clinch. Other than the handful of times I’m using a dry fly, you can bet I have fluorocarbon tippet tied to my fly on the tailwaters. What I do not use, however, are fluorocarbon leaders. Even when I’m nymphing, I still need to control the depth of the fly and I don’t want the entire leader to sink. On the Clinch, I’m usually only fishing a couple of feet deep. So, I prefer to use a traditional nylon leader with the appropriate amount of fluorocarbon tippet attached to the end. Another situation when I routinely use fluorocarbon is when I’m sight fishing for carp on mud flats. The water on these flats is usually slightly stained so tippet visibility is not a great concern. But I’m hooking a commonly 5 to 20-pound fish in about a foot of water. That fish is inevitably going to run me over rocks and chunks of wood while I fight him and I like having the superior abrasion resistance of fluorocarbon to get him landed. In conclusion, don’t let price dictate your choice one way or another. Think about the place you’re going to be fishing. Consider the methods you’ll be using. Weigh these things in your mind and choose the best tool for the job!